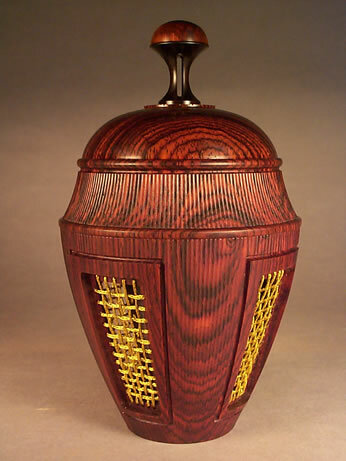 These vessels take their inspiration from classical Greek and Roman funereal urns. The grailing surrounding some of the rose pattern decorations inside the lids is created by cutting a series of concentric small grooves giving the finished effect of a matte background. The thumbnail index is arranged in succession from top to bottom on the leftmost column, and from right to left for the remainder, beginning at top right. The captions are uniquely numbered for each piece. Click on any thumbnail image to see a larger image. There is a contact form to follow up on price and availability of any pieces of interest.